MY2 worked with Miguel Forbes to publish this Q&A on Forbes.com, "Charity Network founder Todd Wagner innovates in pursuit of giving back"
CNBC.com informed readers of the upcoming Charitybuzz Entrepreneur Auction through this article featuring the Charity Network's Todd Wagner and Ben Irwin. Popular Dallas lifestyle site CultureMap ran this story about how Todd Wagner is "revolutionizing" charitable giving. We are pleased to announce that MY2 PR has been selected to provide publicity for Todd Wagner and the Charity Network, made up of three leading consumer-facing online platforms raising money for cause: CharityBuzz, Prizeo and Chideo. We look forward to helping raise awareness of this "One-Stop Cause Shop!" MY2 client profiled in dbj's "Power Players"
As part of a PR strategy highlighting Venture Commercial's 15th anniversary, MY2 approached the Dallas Business Journal's commercial real estate reporter Candace Carlisle, who wrote this "Power Players" article profiling managing partner Mike Geisler. 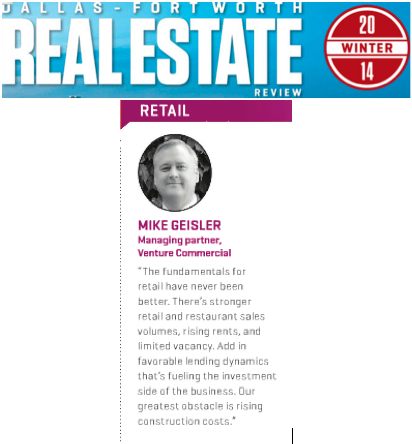 Venture's Chris Gibbons talks about the state of Big Box retail in DFW in this exclusive Q&A with commercial real estate publication GlobeStreet. As a result of ongoing PR efforts by MY2, Venture Commercial executives are often asked to contribute to state-of-the-market articles such as this one that appeared on the front page of Texas Real Estate Business magazine. New MY2 client Space Agent has launched a new online advertising service for vacation and short-term property rental owners and hosts. Read about it on PRWeb and Probnb.com. MY2 is working with Chideo to launch the #RunwithMeb experience, to send one lucky runner and a friend to San Diego to train with Meb Keflezighi. The campaign benefits the Boston Marathon champion's MEB Foundation for youth. "I created the MEB Foundation to teach our youth the importance of 'Maintaining Excellence Balance' in life, as I believe that balance has helped me overcome many obstacles and achieve success," said Keflezighi. "Chideo gives me a place where I can connect with avid runners across the world, share my experiences, and work together to give youth the opportunity to succeed." MY2 secured coverage in The Courier-Journal, the daily newspaper in Jennifer Lawrence's hometown of Louisville, Kentucky, promoting the experience that will send one lucky fan and a guest to the premiere of their movie "Serena."